Combine first 3 ingredients in large serving bowl. Just before serving toss in the salami and cheese cubes. If you’re throwing a green and gold game-day party, consider adding green food coloring to the beer served with Cheese Head Chex Mix®. 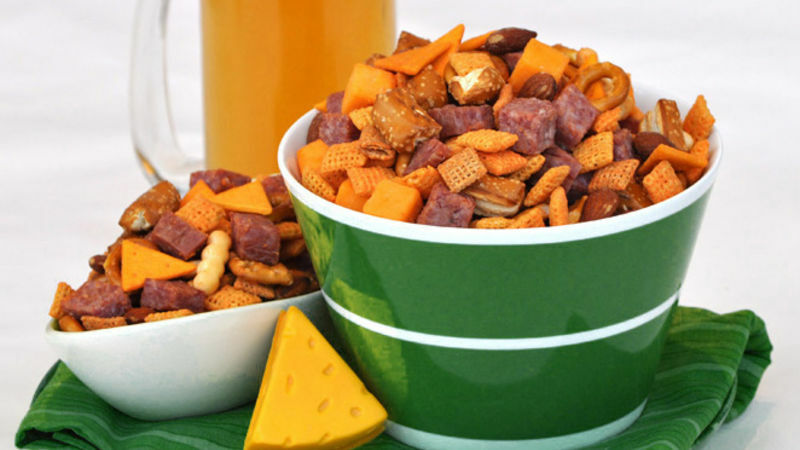 Cheese Head Chex Mix® is perfect for tailgating. Combine all the dry ingredients at home and take the salami and cheese along in individual plastic bags. Mix in when you arrive at the stadium. The perfect pairing for this hearty Cheese Head Chex Mix® is an ice cold beer! If you’re a purist, any Wisconsin brewed beer is ideal.